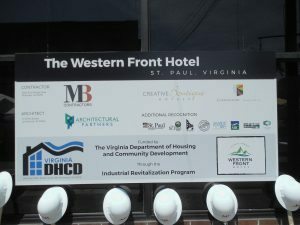 St. Paul, Va. June 16, 2016— MB Contractors, Inc., Creative Boutique Hotels (CBH), and Cornerstone Hospitality broke ground on the new Western Front Hotel in downtown St. Paul, Virginia on June 16, 2016. This historic renovation/adaptive reuse will transform this over 100 year-old building to support 33 hotel guest rooms, rooftop dining, rooftop bar and entertainment space, and a restaurant and music venue. This project is made up of two contracts worth just under $5 million involving the old Willis building and Dye property. Q: The Town of St. Paul is one square mile and is home to a very deep-rooted, mountain heritage. How do you intend to provide interior design and operational services, which embrace that heritage, and also attract a diverse customer base? A: One of the reasons we chose St. Paul for a destination boutique hotel is because of the surrounding area, the warm people who live there, and the activities that occur in this region. So many travelers are looking to get out of their everyday life and have experiences. The St. Paul area offers Spearhead Trails, the Clinch River, hiking, cycling, river activities, and so forth. In addition, there is a lot of history in the region for those who may be looking for less lively activities in the way of museums and theater. 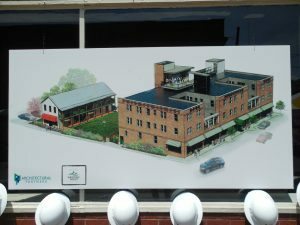 The renovation of the Lyric Theater, the Sugar Hill Brewing Company, and so many other great venues are opening up in the region and they all add to that experience. So, whether a guest is traveling on business or for pleasure, there will be something for everyone! Q: As the architect, how do you define success in designing this project? A: The development of a successful boutique hotel involves more than just a historic building being saved, or a small downtown being rejuvenated, or a scenic environment becoming more accessible. It really involves telling the story of a community and the people who have created that community, past, present and future. St. Paul and the surrounding region have a rich and unique history that will interest people from all over the country. Our job is to create an exciting welcome mat for the guests visiting St. Paul, and a meeting place where guests and residents can share this community’s unique story and add their own individual stories to its legacy. The Western Front Hotel will be the perfect setting for that important and enthusiastic interaction. Michael Cagle, P.E., CBH Partner and Executive Vice President of MB Contractors, Inc.
Q: To set the stage again, this building is over 100 years old. What does the building process look like when doing this kind of renovation? A: With any historic building, there are a few major points that make this work very interesting. The first comes in performing the initial assessment of the building. Many assumptions will be made from this assessment so it must be done right the first time. It is interesting to peel back the layers to see what kind of historical facts can be found in regards to earlier construction and how things have stood the test of time. Also, as we restore a building, it is quite rewarding to bring different aspects of the project back to life that may have been covered up over the years. Todd Morgan, MBA, CBH Partner and President of MB Contractors, Inc.
Q: In pulling from a long list of factors that were taken into consideration, what were a select few that sealed the fate of The Western Front Hotel in St. Paul? A: Immediately upon arrival for our first team visit, we were sold on the manner in which the leaders and “future-shapers” in the Town of St. Paul were working to bring this project to fruition. The feasibility and market studies not only took the needs of the market into consideration, but the potential of the property to be adapted for the intended re-use. Some additional factors for consideration were also architecture, constructability, and financial engineering. After completing this due diligence work, we were then convinced this project had huge potential for becoming a valuable asset for the Town of St. Paul. The Western Front Hotel is scheduled to open Spring/Summer of 2017. Check out our Facebook page for the photo album.